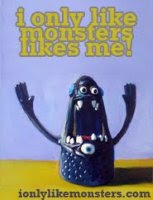 I think monster tshirts would be awesome. I've been brainstorming ideas for awhile and have a few that might possibly be shirt-worthy. Here are some pictures that show what I'm thinking. All the designs were hand drawn by me! The "I'm a little monster" shirt would be blue, "Glasses" green and "Ice Cream" aqua. Could you do me a favor and answer the following questions in the comments. You can be anonymous [as long as you're not mean.] If you want, you can leave feedback on my Facebook page too. Thank you! 1. Which shirt would you be most likely to buy? 2. What sizes would you need? Child sizes, adult sizes? 3. Which shirt would you be least likely to buy? 4. Would the "I'm a little monster" shirt be okay without the text? 5. Honestly, are the glasses on the monstapus [green shirt] way too big? 6. Do you have any ideas that would make any of these shirts better? Let me hear them! 3. Little Monster. It's so cute for a kid, but let's be honest, I'd buy one for me! 4. It'd be fine without the text, but I think the text is what makes it special. 5. The huge glasses are the best part!! 3. Glasses, just not my style. 4. I agree with others, it would be okay but its better with the text. 5. My opinion is not valid here, not fond of the glasses. oh yeah, and 6. Keep them coming!! Let's see more designs with different objects cuz I think you're on a roll!! Thank you, Stella!!! I have a million ideas so it was hard to pick just 3! These designs are awesome, way to go! The glasses guy could be a "nerdster." He could be not only a monster, but a nerd...and maybe a hipster. All sorts of possibilities there when you cross those three things, haha.